Extra Vision Clip Corner showcases are intended to increase the display section in corner areas. 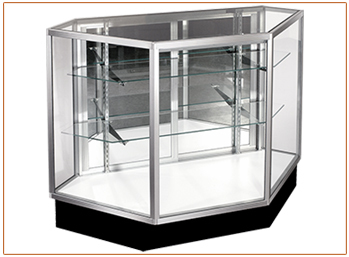 Inside Corner cases allow you to reverse configuration, thus the display area on an Inside Corner showcase is on the smaller and inner side of the case, facing the customers (refer to drawing). Extra Vision corner showcases are compatible with all Streamline Extra Vision showcases. Each case comes with two clipped shelves to match the adjacent cases. The overall dimensions of Extra Vision corner showcases are 38” high and 20” deep. Three sizes are available, indicated by the amount of square space each occupies: 34” square (48” diagonal), 42” square (60” diagonal), and 51” square (72” diagonal). Overall height of all models is 38". Glass display area is 32" high and 20" deep. Black kick base is 6" high.